Fellow music teachers, have you ever wished there was someone you could approach for specific advice on maximizing the earnings and efficiency of the niche market of private lesson teaching? Look no further! I give you your new career guide: David Cutler’s The Savvy Music Teacher. Having just finished this book, I was extremely impressed with the author’s ability to relate and expound upon the daily struggles of private teaching combined with the provision of various strategies for financial and personal improvement. At times I found myself turning pages with the excitement of a Harry Potter novel! 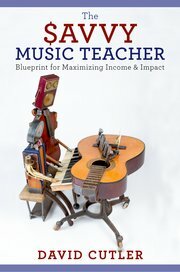 The book outlines a clear goal: Become the most impactful music teacher possible while earning a yearly salary of $50,000 to $100,000. Is this really possible for us private teachers? I can say, without hesitation, that if you were to aggressively implement David Cutler’s strategies into your financial model of music teaching, you would be well within this figure. 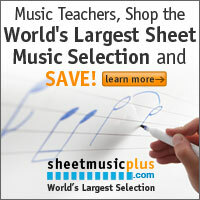 How many unorganized or un-savvy music teachers do you know living week to week, with no concept of their financial future, or present earnings? This sad situation can even sometimes lead to musicians leaving the music field entirely. If this describes you or a teacher you know, this book will be a lifeline for changing your views on earning and managing money, as well maximizing impact on your students. Even if you consider yourself a highly organized teacher without any more room for financial expansion, this book will outline additional financial avenues you may have not considered, or overlooked, that will enhance your current earnings. If you believe you are already implementing these elements into your small business of music teaching, you will be surprised by the many avenues available you may not have considered in each chapter. Specifically for me, I always see a significant drop in earnings during the summer months. I’m teaching as many students as I can, but it is never enough. This book proposes a detailed process on establishing summer camps, and clearly outlines the large financial benefits this type of event can have on your summer earnings. If you feel many of these categories are not realistic to you, you may be surprised at how easily you will be able to generate extra income from the author’s suggestions. True, not every teacher may be able to integrate every stream into his or her lifestyle, but even getting just a few streams of music income going besides private teaching can really have a positive effect on your bottom line earnings. The second half of the book is dedicated to setting up your studio, filling your studio, time/life management, winning the money game, your financial picture, and career blueprint. In a field that can easily be isolating, these chapters are gold. How often can one receive free financial advice specific to the private lesson field? These chapters are even more valuable than the first half because they help motivate music teachers to plan for the future of their business, and not live in the now of lesson check to lesson check. So, what’s your real job? This is a question I am asked all too often by both my parents, students, and sometimes fellow school staff/administration. My response (much to the shock of the onlooker) : Never. This is just one of many examples when the career path of a freelance musician can not be confined to a neatly wrapped package. Being freelance is hard to explain. Are you a school teacher? Well Kind of: I teach just saxophone though, to one person at a a time, without an assigned classroom…… Also I am not on the payroll, and I receive no benefits…… But I do have a parking pass and a badge! Your students are your employer and Its best for you if they know that. Music is a noble art; we are trying to reach an abstract goal that really has no mountain top or concrete ending point. Often times in our creative ways, I think its easy to assume that everyone we associate with knows about our quest for great art! Unfortunately students and or parents sometimes do not understand the years of schooling at a university or conservatory, the thousands of hours of practice, the hundreds of performances, hours of our own private study, immeasurable costs of instruments, music, supplies, music, other miscellaneous musician costs, and the continual development of our craft just to reach the point where we can have financial security in our chosen field of employment. They more likely assume you are someone who played in high school band and now teach a few kids as a hobby. Sigh,…. So, at the start of this year when I sent out my billing policy I simply informed my employers (parents) that this is what I do. I nicely and professionally explained that this is my sole form of employment and my daily job. Since then I have been paid on time by my students much more frequently than before! Perhaps parents now simply feel bad for me assuming their child is my sole source of income, or perhaps they have gained a deep appreciation for my life long quest of art. But either way, I’ve been sending a lot less emails asking for money! Anyone else out there have any tricks for explaining your occupation?